To continue the momentum toward achieving disability rights in Armenia, participation from all segments of society is needed. Join the movement! The RightsNow! project is honored to work with disability advocates and allies in Armenia to strengthen communities through disability rights implementation. 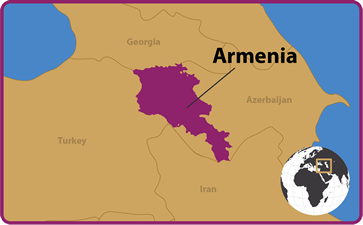 Armenia is at a critical juncture in its disability rights history. The U.N. Convention on the Rights of Persons with Disabilities (CRPD) was signed in 2007 and ratified in 2010. The National Assembly of Armenia conducted hearings on adoption of a new national disability law, the Rights Protection and Social Inclusion of Persons with Disabilities Law. Drafted with participation of leading Disabled Persons Organizations (DPOs) and disability NGOs, the new law would replace the 2007 Law on Social Protection of People with Disabilities. Based on social inclusion rather than a social protection model, the new law would bring Armenian legislation into greater compliance with the CRPD. To date, the law has not been adopted. In spite of constitutional and legislative protections, barriers to equal rights and opportunities for people with disabilities persist. Article 30 of the Armenian National Constitution ensures the right of every individual to an education, as a guarantee of development of future employment. In reality, however, few schools are accessible for children with disabilities. Universities and trade schools are also nearly universally inaccessible. The 2003 Law of Urban Development states that all public buildings, new or renovated, should be accessible. Yet, lack of enforcement mechanisms has prevented implementation. Restricted access to education, compounded by inaccessible infrastructure, contributes to a bleak 9% employment rate for Armenians with disabilities. Disability-led organizations, policy makers, legal experts, civil society actors and international NGOs are actively addressing these issues, and engaging to identify solutions that will guarantee full inclusion of disabled citizens through effective implementation and enforcement of laws and policies. The RightsNow! 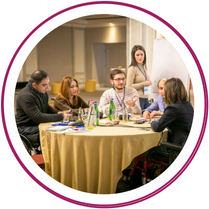 project welcomes all people to become actively involved in moving the disability rights agenda forward in Armenia using the tools and resources made available in the Global Disability Rights Now! resource center. ​2015: MIUSA partnered with AGATE Rights Defense Center for Women with Disabilities NGO. Based in Gyumri, AGATE works closely with MIUSA and the RightsNow! Consortium to plan and implement all RightsNow! project activities in Armenia. October 2015: The RightsNow! team conducted a 5-day introductory visit to Yerevan and met with a wide range of stakeholders to get first-hand information on the status of the national disability legal frameworks, implementation strategies and disability rights initiatives. The U.S. experts met with DPOs, civil society and human rights organizations, and Ministry officials. May 2016: RightsNow! sent a team of experts in disability law, coalition building, and political advocacy to Yerevan to conduct a five-day training and work with DPOs, government, and civil society leaders. The training resulted in the development of working groups on issues such as accessibility in higher education, physical access to public buildings, development of parent education groups, community-based alternatives to institutionalization, prevention of gender based violence among women with disabilities, and promoting the rights of persons with mental health disabilities. January 2017: RightsNow! technical experts collaborated with RightsNow! partners on advocacy strategies for political participation and accessible elections. The convening of DPOs, civil society organizations, and lawyers led to collaboratively drafting a policy platform, the first in Armenia. Eight of the nine political parties signed the platform. November 2017: The RightsNow! team established an Advocacy Strategy Committee. The committee drafted a ‘Blueprint for Advocacy’ targeting adoption of the draft disability law. The “Blueprint” mapped out political advocacy, media and community outreach objectives. 2016-2018: The RightsNow! Consortium and team of legal and political strategy experts provided technical assistance to Armenian DPOs, government Ministries and members of Parliament to strengthen enforcement and ensure rights-based language is included in the “Draft Law of the Republic of Armenia on Protection of Rights and Social Inclusion of Persons with Disabilities” and to advocate for its adoption. The key resources below are available in Armenian. It is our intention to continue to provide additional resources in Armenian.